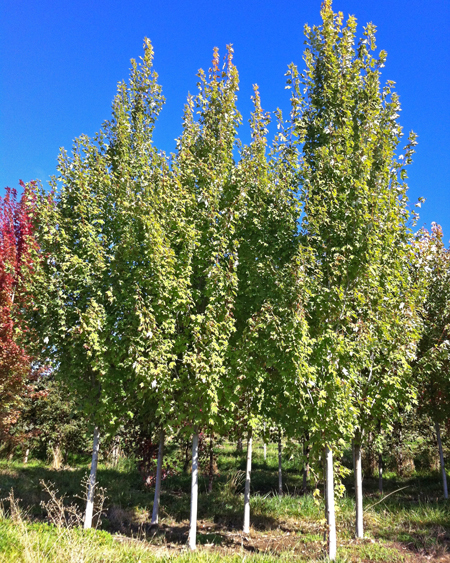 Acer rubrum 'Armstrong' is a fast growing, upright and narrow tree that grows up to 60 feet tall and up to 25 feet wide. It has very attractive silver-grey bark. The leaves are 3 to 5 lobed, ovate, and 2 to 4 inches long. The leaves emerge as a crimson red in Spring, turn a rich green in Summer, and then return to a reddish burgundy in the Fall. This tree is an excellent choice for growing along narrow streets because of its columnar habit and because its roots won't lift the payment with growth. It's also a great choice for a specimen or shade tree. Grow your Armstrong Maple in full sun to partial shade. This tree thrives in wet or moist places and has no particular soil texture preference. However, chlorosis may develop on alkaline soil.